The Future and Emerging Technologies (FET) draft work programme (as part of Horizon 2020) is now published and it contains the almost final version of the calls to be announced officially 2013-12-11. Global Systems Science is there under “FETPROACTIVE1” with a prel. budget of 10M EUR and an application deadline of 2014-04-01. Here are two documents I have written over the summer on beginning to define a “science of cities” or Urban Science. The first is a “ghostman” outline for a future (5-10 years) textbook on Urban Science that grew out of a workshop on cities at the Santa Fe Institute. The second is a talk on “Cities as Systems” that I gave at the request of Ralph Dum at the European Forum in Alpbach, Austria in August 2013. Here is a chapter I wrote for a book on “Rapid Urbanization and the Future of Transforming Cities in Asia”. It is edited by Professor Genie Birch of the University of Pennsylvania. The book will be published early in 2014 so please do not distribute widely. The chapter deals mainly with the problem that municipal governments have been slow to adopt ICT as an agent of transformation. It does not deal specifically with smart cities. The 2nd Open GSS conference was great, many excellent ideas discussed and debated. Now it’s important to keep the dialogue ongoing using the Internet. We have set up a special idea and brainstorming website for Global Systems Science at https://global-systems-science.yrpri.org/ for use by anybody interested in participating. This website is a part of Your Priorities and is operated by the non-profit Citizens Foundation in Iceland that fights for open source electronic democracy. 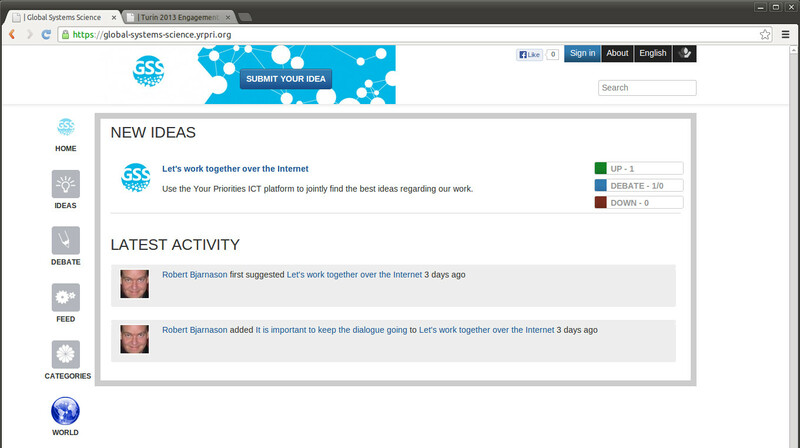 We can use the website for sharing, prioritizing and debating ideas, helping us focus on the most important ideas. Create a user at the top right by clicking ‘Sign in’ – we recommend using Facebook login as it is quickest but you can also use email. Click on ‘New idea’ at the top left of the screen. We are Róbert Bjarnason, President and Gunnar Grímsson, CEO from the Citizens Foundation in Iceland, a non-profit focusing on promoting open source electronic democracy. It was founded as a direct result of the global financial crash in 2008. The Citizens Foundation has the aim of connecting citizens and their representatives online and give citizens more influence and oversight over the day to day running of their communities. We represent the interest of citizens and they are our only master. We believe that democracy is under threat, especially by the lack of participation by young people and that the Internet is the best way to reach and motivate them to participate in democracy. We believe electronic democracy is the future of democracy. It puts pressure on authorities to do their job properly as well as harnessing the minds of the masses. Great ideas can come from anywhere not only politicians. We are social entrepreneurs with decades of experience in the Internet startup world. Among many exciting projects we have started the first web companies in Iceland 1993 and in Denmark 1995. We have won many industry awards including two Bafta awards for work in the online games industry and the European eDemocracy awards in 2011 for our work on the Better Reykjavik website. We look at the Citizens Foundation as a startup enterprise. The service we are providing is a product and the citizens using our service are our consumers and customers. The key metric of success for our websites is participation. Without participation there is no democracy. Looking at citizens as consumers of our electronic democracy product allows the use of proven methods from the startup world to keep our customer interested in participating and coming back to participate more as well as enticing others to participate. Our biggest challenge with democracy as a product is that citizens don’t believe it works. Our customers need to know that their input will be used in some productive way. For example on our Better Reykjavik website, each month the top ideas in all categories are gathered by city officials and sent for processing by the city, keeping citizens informed all along the way. In the People’s Assembly in Estonia the President promised to put forward the citizens priorities as law proposals in the Estonian parliament. The second big issues is marketing and PR. “If you build it they will come” is a famous quote from the early days of the Internet – this was never quite true and certainly is not today. Marketing and promoting a website is a lot of hard work and costs money. As democracy nerds we are worried that most of our social lives are being run by one company, Facebook but as entrepreneurs we always try to turn problems into opportunities and in our experience Facebook is the best way to attract people to electronic democracy both via sharing and Facebook advertisements. There needs to be as little friction as possible. 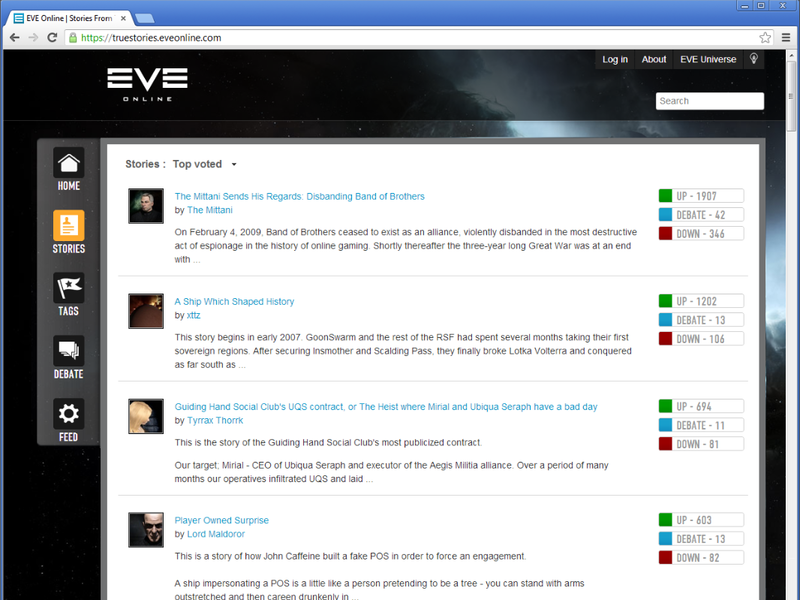 For example, on our websites people can participate using their Facebook login. Somebody shares a link which a friend, clicks and is taking part in the debate with just two mouse clicks. The user interface has been simplified in every generation of the software to enable more people to participate more easily. Finally, taking part needs to be fun and rewarding. On our websites you can earn Social Points for writing up points for or against ideas that many people think are helpful – then you can use those Social Points to buy promotions for your ideas that appear as banners at the top of the page. As a part of your marketing you could even offer cash prizes for participating. You might for example to have an idea drive to find the best ideas to save money in a given category and give a cash prize to the citizens that come up with the most practical and socially acceptable ways to save money. Consumers today are a lot more active thanks to the Internet, they can do price comparisons, easily read up on product reviews and consume in a smarter way than before. Looking at the online citizen as a consumer of democracy brings real results. 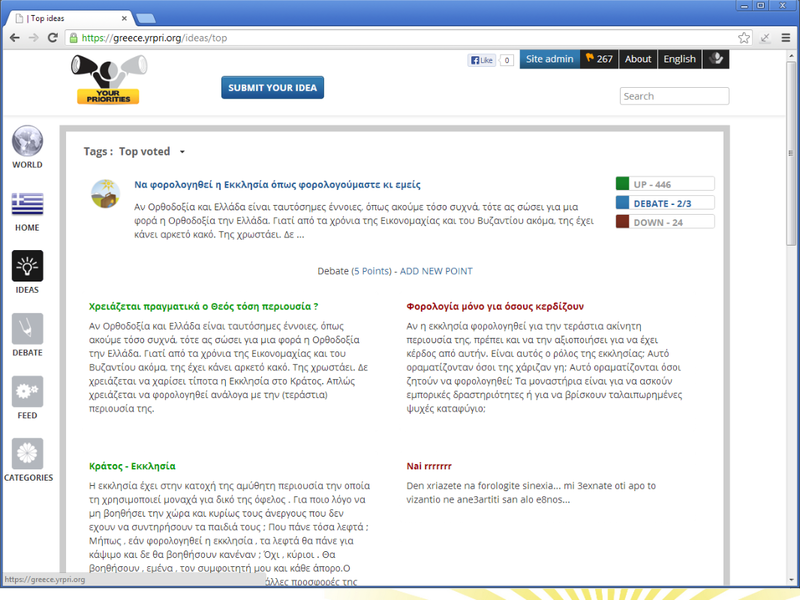 Our debate system is a key innovation in our eDemocracy platform. We wanted to avoid the well known problem of traditional website comments system where people easily fall into yes and no arguments which often ends in personal personal attacks and other destructive ways of debating. So we decided to separate the two sides into two columns, one with points against and the other with points for each idea. This effectively eliminates the destructive debate as the best way to persuade others is to be constructive in your arguments. Users can also mark points as useful or not which means that the best points rise to the top which helps passive users to get an overview of the best points for and against an issue. 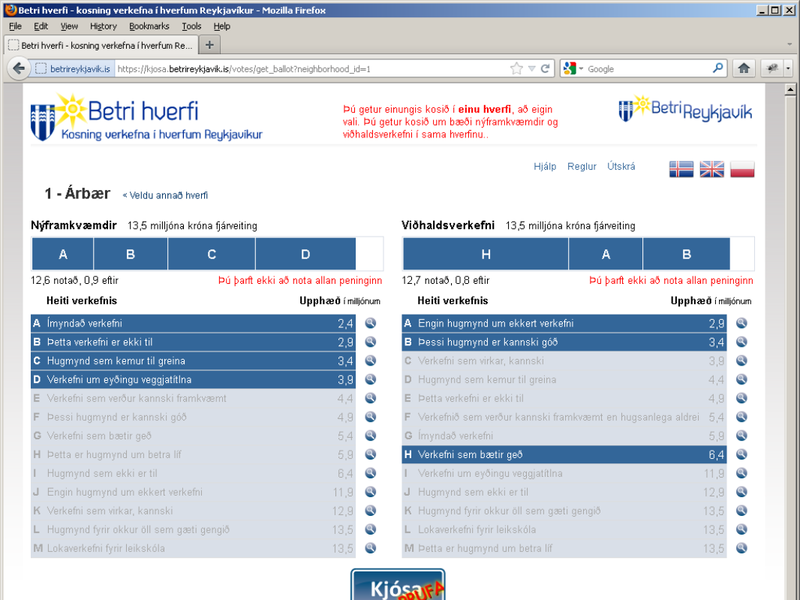 Better Reykjavik is our first successful example of a Your Priorities website, in terms of participation. 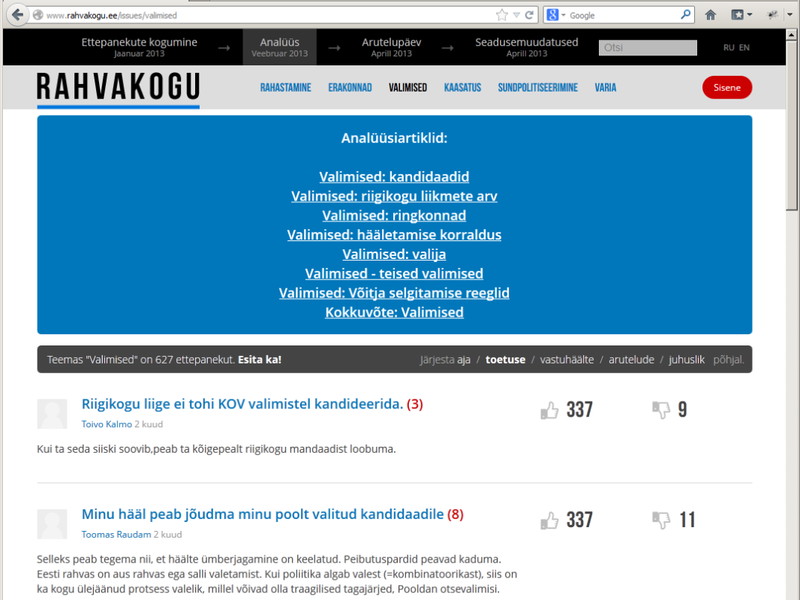 The website is actively used by residents of Reykjavik, Iceland, creating open discourse between community members and city council. Better Reykjavik launched in 2010, and played a vital role in the year’s city elections. During these elections 43% of voters participated, and over 1000 ideas were created. 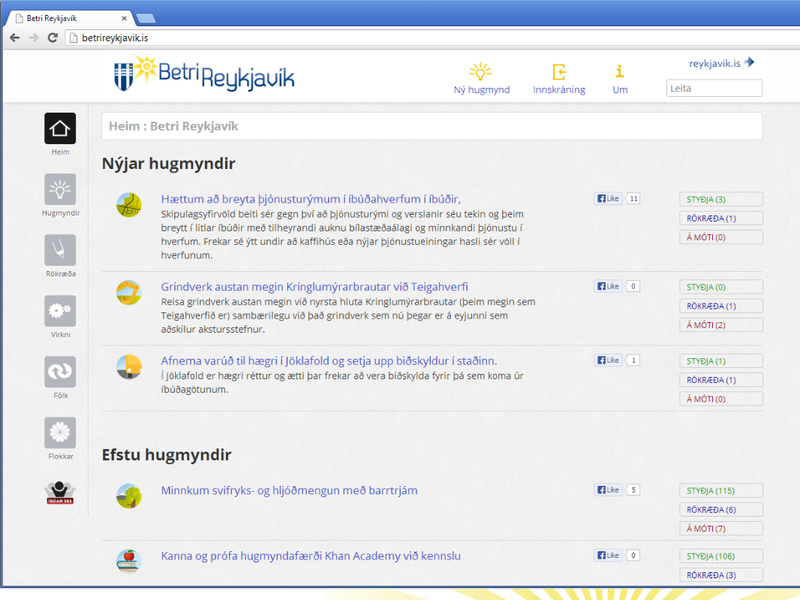 Ten to fifteen top priorities from Better Reykjavik are being processed by Reykjavik’s City Council every month. For the past two years we have also done participatory budget voting in Reykjavik which uses Better Reykjavík for collecting ideas but a separate system for the secure binding voting. 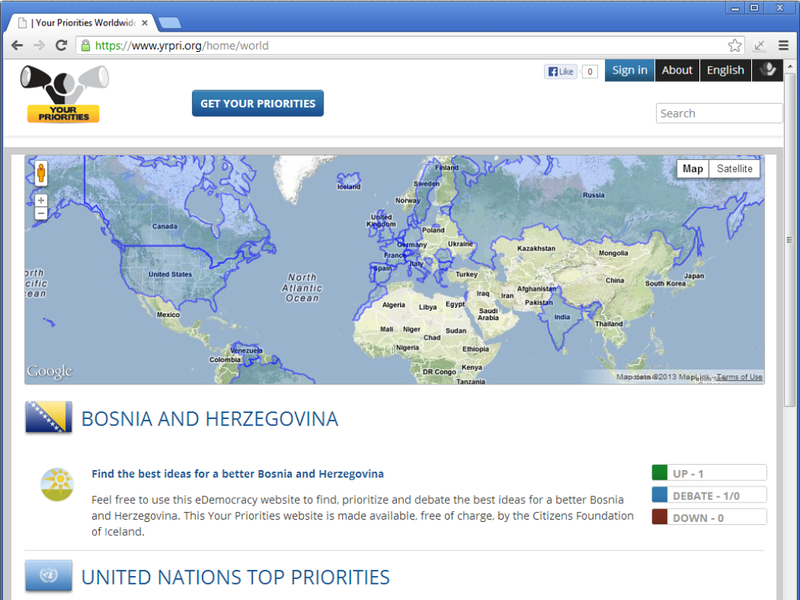 We’re now working on and looking for funding for a democracy project in the Balkans. Currently there are 11 projects from 7 countries signed up with different focus on how to use e-democracy to improve their communities. Recently we held workshops in Sarajevo and Belgrade in how to use our tool as well as meetings about the project. One of the key things is the transfer of e-democracy knowledge from Iceland and Estonia to the Balkans as well as knowledge transfer between the Balkan countries. There are 3 project from Serbia, 3 from Kosovo and one each from Albania, Bosnia, Croatia, Montenegro and R.Macedonia. Martin Elsman from HIPERFIT (@DIKU.dk) will present GSS meets Programming Languages and Systems in the workshop on GSS Languages, 2013-06-11. Abstract In this talk, we demonstrate how functional programming and domain specific languages, in particular, can be useful for effectively deriving performance efficient programs and systems. As an example, we outline a system for specifying financial contracts (used in practice by the financial industry) and demonstrate the effect of applying programming language technology to derive tools for pricing contracts efficiently on modern parallel hardware. We argue that research in managing and querying big data and efficiently performing big computations (simulations), as for instance carried out by the HIPERFIT research center, is a central ingredient of the development of a Global Systems Science.